I have had quite a few lovely comments and emails from readers - ie, you lot! - regarding my hair. You see, my hair typically looks crap so the fact that it has been acknowledged as looking less crap is quite odd! As you would expect the routine itself is not that complicated - wash, condition, style and go...but there are a few products I absolutely swear by to attain the look that I am going for. That look by the way is the "imperfect wave". I don't want neat little curls or waves. It's okay to look a bit messy. I want it to look organic, like I have naturally full, wavy hair texture. I'm all about faking it. L-R: Phyto Phytorhum shampoo, Phyto Phytobaume conditioner, Phyto 9 leave in conditioner and Beach Blow texturising mist. PS. I am not sponsored by Phyto. I just really like their stuff. L-R: Redken Real Control Thermal Resist, Black & White styling wax, Elnett hairspray, Batiste dry shampoo (used for day after - or even two days after - washing) and Babyliss Conical Wand. 1) Wash hair - use Phyto shampoo and conditioner - and when hair is about 70% dry, put some Phyto 9 on the ends. We are talking about a 50p dollop size applied from mid lengths to ends. For now this replaces any oil and maybe I prefer this? It's lightweight and yet soothes the ends. I feel odd without it. 2) Prep hair with Beach Blow hair texturiser - i.e randomly spray in the roots. This is a sea salt spray I got last year in Newport Beach - so not exactly easy to find! It's a good product - much better than Bumble & Bumble's - and after heat adds some much needed volume, a "day old" feel and a soft matte finish to the hair. 3) Blast hair with a travel hair dryer (no T3's round this neck of the woods!) and then go to sleep. Yes, that's right. I always wash my hair at night and I let it "rest" before I start the curling ordeal. I do not sleep on wet or damp hair as I will guarantee to wake up with some weird peak at the crown that will require a hair wash to get rid of. I then go to sleep and ponder on the ultimate hair question: will it be less frizzy by morning? 4) By morning it is still frizzy - and quite big. I like the big part but I also like waves so say bye bye to this look. 5) Spray/drench hair in Redken's Real Control heat protectant. Then locate a hair band - which I continually buy in packs and yet continually lose - and get to work! 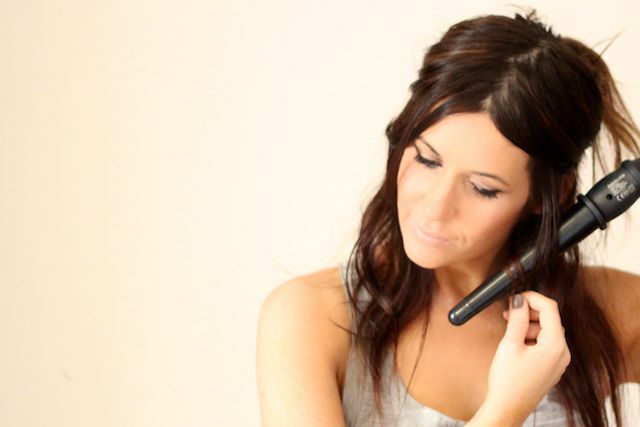 6) Heat up the Babyliss curling wand to "scorching" and forego gloves. Separate the hair into sections and start wherever you feel comfortable. For me this is always the bottom section at the front. As a general rule work away from your face. I do this all the way to the back sections - they get curled any way I can do them. 7) For each curl keep the conical wand in place for 5-10 seconds. Ensure the fattest part of the wand is the nearest to the root - the curl should really only appear a few inches away from the hairline. Then release. Ta da! 8) Complete head of hair and marvel at the curls. 9) The next part is the critical part...the brushing. This softens the waves and makes them look a little more carefree. For this I use my beloved Mason Pearson Junior brush. I have had this for 15+ years and there is not a day when I don't hold it in gratitude. Do you need to go out and spend $80+ on this brush? No. For reference the Tangle Teezer and the Aveda paddle brush works similarly. 10) At this point you could stop. However, I always do a couple of final things. Blasting some Elnett hairspray around the crown is certainly one. But secondly, and the key step, is using a teeny bit of Black & White styling wax to "seal the wave". This stuff is incredibly cheap and absolutely fantastic. It doesn't weigh down the hair but it will define it for you. If you have flyaways or frazzled ends its also a good quick fix to disguise them whilst still being easy to brush out if you need to. Beats anything I have tried from TiGI, Bumble and Bumble or Aveda. Buy it in Boots/Superdrug/anywhere for just a few pounds. As the day goes on the hair drops and settles and inevitably looks a lot better than the above picture. The day after this whole routine I just brush my hair in the morning with the brush (funny that!) and then apply a little more Phyto 9 and/or Black & White wax. If I feel like it's all looking a bit sad and flat I dry shampoo the shizz out of it and rub manically to remove the "old lady" white residue. I feel like this might be disappointing to read because, as we already knew, I am no hair guru and I haven't revealed anything other than known and rather pedestrian tips and tricks. Still, this is what I currently use and these are the steps I go through. Whilst I am sworn loyal to Phyto I am still interested in other styling and treatment products so if you have any recommendations please do share them below. I must invest in a curling wand! I love brushing out curls it just makes the curls look more casual. Loving the colours of your hair too! But..but... I LOVE your hair and how you style it, it's no crap at all!! @Mania - i don't actually but i will ask her next time i go in...she bleaches and then uses a specific toner so i will get the name. Love your hair and colour is amazing too, so rich and nicely broken up with the lowlights.. Thanks for sharing the hair routine! I'm so jealous that you can ride out this hair style for a few days without washing and have it still look great. All that volume, how I wish I had it! Laura your hair looks gorgeous! I may need to invest in a concial wand...I always use the Babyliss waving wand out of the fear that a conical wand will give me ringlets and leave me looking like a doll :P But if you haven't tried the waving wand it's amazing! @Gemima - love me some texturiser. if you are in the UK Lee Stafford does a fab one! @imc1971 - absolutely LOVE the sound of that product! thank you! @arlene -thanks arlene! okay this comment may send me over the edge to get that product because i have heard things about it (all good!) for years. glad that it's working fantastically for you! @Computergirl - i always find that the most phenomenal hair days are when you are going to get your hair cut/coloured...when change is approaching it seems that then it sorts itself out :) Re: conical wand I would definitely recommend - they are surprisingly easy and much quicker than using a straightener for curls! @Lydia - thanks Lydia! ooh a new brand...will check them out! @Reeny - thank you so much! @Becca - ooh waving wand? may have to look into that! Silly little tip, but I found 1 or 2 sprays of heat protectant after I use dry shampoo gets rid of the white residue quickly after some brushing. You could use plain water I'm sure, but I like the light conditioning properties of heat protectant over dry-shampooed hair. Also I have never tried this with a more oily/slick heat protectant just the watery kind. My boyfriend loves Phyto! Lucky for him his mum works in a Pharmacey & gets it all for free! Thats quite a routine you have going on there! I don't put in half the effort you do or even half of the time or products for that matter. You're hair always looks great though so perhaps I should be taking note. Thanks for posting this, very interesting, might purchase one or two of those products and give them a shot myself. @glamour rouge - one for my UK shopping list! thank you! I was never into styling products, but ever since I recently got my hair cut I have been inspired. I always wash my hair at night and I thought that putting product in or blow drying it would be pointless after a night's sleep, but it seems to work beautifully on your hair! Thanks for the tips, I'm excited to try a new routine! Your hair looks lovely :) every time I try to do anything to my hair that involves curls or waves it goes in a huff with me refuses to co-operate with me. I'm thinking about taking it onto Jeremy Kyle and hope he'll scream at my hair with his amazing catchphrases. Gorgeous! 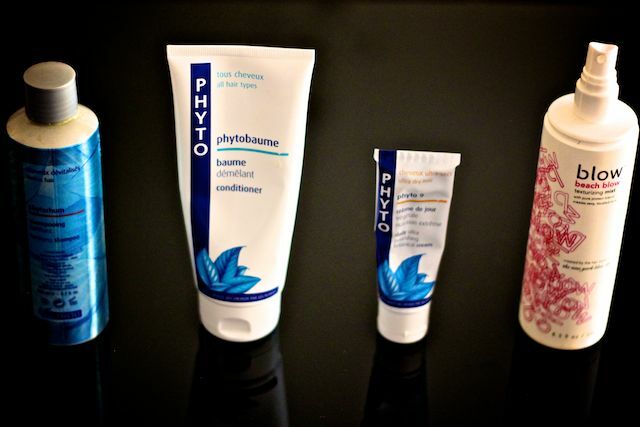 I am desperate to try Phyto after your rave reviews! I think it will be next when my current shampoo runs out! I've recently been brushing my curls out too and it makes such a huge difference, it still makes me nervous to do it!! I am glad I'm not the only one who buys endless packs of hair bands only to misplace them all within days! 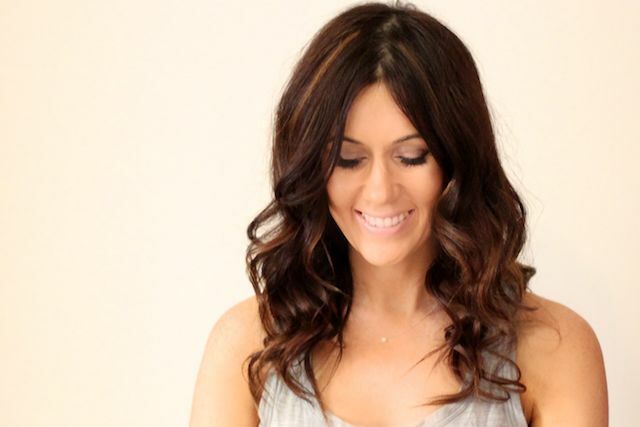 Gorgeous hair and thank you for sharing your tips. I swear by Kerastase products and in particular the Ciment Thermique product which you apply to damp hair before blowdrying. It makes your hair feel like real hair even though I've spent years colouring and straightening the hell out of it...I highly recommend it. I too love and strive for the imperfect wave! Thxs for the post, its was v helpful. Will look around for the products you recommend. I'm currently using Moroccon oil & I find its helping control the frizz! I love phyto too but going to try out bumble & bumble. But I think phyto 9 is something I would never stop using! @Georgia - as far as i am aware all their products are paraben and sulphate free...i could be wrong on this but they are one of the brands that try and steer well clear of these kind of ingredients! @Mila - i used to do that alot but strangely now it doesn't seem to work like it used to. maybe my hair needs to be another couple of inches longer or something...i hope that's the solution because that's the best route to wavy hair! @katie - i know a lot of people that love that too. i tried it and didn't get on too well but not sure i used it properly! This is exactly the type of look i go for! I find a good ol salt water mix does the trick just as well. Should definitely put more effort into my hair - I start with good intentions but then instead I stay in bed for longer and just chuck hairspray on it before leaving the house and spend the day moaning about it's lack of body and general 'blah'-ness. It's a vicious circle. You might possibly have inspired me into action though - thank you! P.S. like Your sense of humour and stile ! Thanks ! Great post! I love how your hair always looks polished but still has some life to it. Yes I DO! From TIGI, the volume spray << Queen for a day>>... After trying hundreds of products of this type, now I'm at the third can of this and I almost forgot how horrible my hair looked in his own natural way. Great post it's always nice to see how other people do their hair! Such a great blog. I love how you actually explain what the products do and why you use them instead of saying "I LOVE THIS! 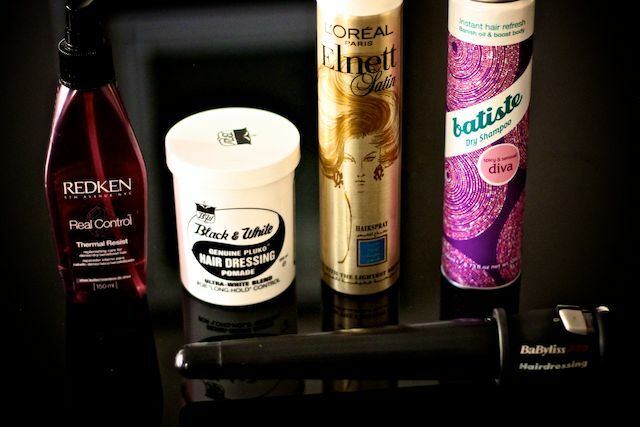 :)" ps love the elnett hairspray--amazing amazing stuff! Ive heard really good things about the Blow products, ill have to go pick this up and give it a try! Always enjoy a hair care post:) Your hair looks great. Phyto are fab, found them through you. Really rate the Phytocitrus conditioning mask! Currently using the Redken All Soft as a prewash treatment for my hair (good) but nothing in the world has ever wowed me like Morrocon Oil which I tend to use (when I can afford it . . .) pre-blowdry and also to defrizz after styling. have you tried Redken Smooth Down Butter Treatment?? It usually keeps the hair smooth and frizzless! but your waves are gorgeous! oh, love! it takes me ages to curl my hair with my conical wand, I usually use my GHD to prevent burning my hands haha. So unco. You look beautiful Laura and this tutorial is amazingly well detailed! Can you tell me the name of your stylist who cuts your hair in Dubai? Looking for someone to trim my hair. I think your big "frizzy" hair looked fantastic! you should try wearing it that way one day it really was very pretty. GREAT post! Your hair DOES look lovely, such effortless looking curls. I want to try the curling wand now! You hair looks gorgeous!! I absolutely love conical wands!! Had to laugh at the "curling away from the face" bit - I am still trying to master that. Until then its a loose hot roller, and a brush out! Does anyone know a good, yet inexpensive salt spray available in North America? I've tried a few more expensive ones, and have been unimpressed. Such great tips! I got a conical wand last year and for the life of me have not been able to work out how to get good curls from it. I'll try it this way next time :) thanks! love phyto, and seriously missing your tutorials! Thank you so much for this post Laura! I am now looking for a conical wand! I have tried to find Phytorhum but im struggling so I got another one from John Lewis, think its called Phytovolume so hoping it it just as good! (it seems VERY liquidy?) The Phytobaume had 3 versions im my JL so I just went for the one for colour treated hair. The packaging is also slightly different to yours, they must have changed it. I have the Umberto Giannini Salt Spray, not sure what its like yet had it ages and not tried it! Just a quick question, when you dry your hair do you dry it with your head upside down or just rough dry it normally with your fingers? Thanks again for this post, I really appreciate the time it must have taken. Laura, I've awarded you with Kreativ Blogger Award. I've been following you since I found your blog after Youtube. I loved you on Youtube, and hope that someday you can go back to doing something in that field again. You are one of my favourite bloggers, I love your positivity and unique style. There is a post on my page about it. lovely! Any idea what size curling wand you have...? 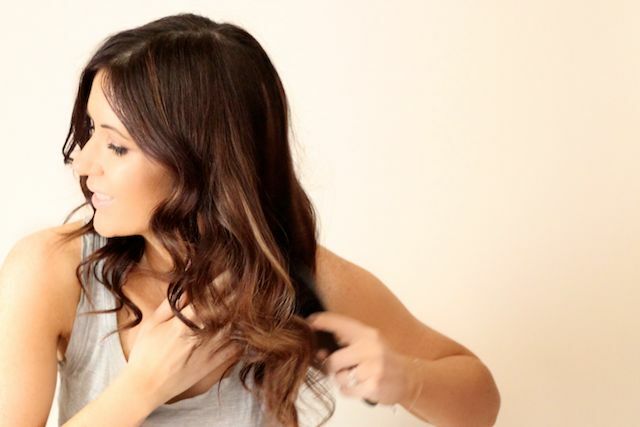 That's a fab yet simple hair routine, and your hair looks in gorgeous condition! Lovely thick, shiny and looks well looked after! We use Black and White wax in my salon is does a very good job! I have to try one of those conical curling irons. Kerastase products have changed my hair this year, they are crazy expensive but oh so addicting. The reconstructor milk or the hair masques are a good place to start if you wanted to splurge. Thx for the great tips! I recently tried the Boots Coconut and Almond intensive hair treatment. I had heard good reviews from it and for £2 didnt mind giving it a try. Absolutely ridiculous the change it has had on my hair, it always feel so nourished and healthy! Would definately recommend! Lovely hair :) I would love to know what size conical want you use? your hair is beautiful - I am a Phyto junkie myself!! swear by their stuff. what kind of curling iron do you use? I'm so happy i found you blogging again! You're my inspiration! I think I just jumped for joy :) I found you again. I check back often and then I googled your old name and found you again :) love love love you and so happy to have your thoughts back into my life. I have started blogging now and would love for you to check me out and follow if you like. So glad to have found you and get to follow your advice again. Look forward to it and now I have some reading to catch up with. I think this hair products information is quite impressive and I personally suggest people to read it. Quality work. Such a nice sharing.I like your blog your post is very informative. Good one!! I thoroughly enjoyed reading your post!! Keep it up! Buy 100% virgin pure human natural hair, unprocessed, full cuticle, double wefted, weighted about 100g, non-shedding, tangle free and with no lice, can be dyed to any color and ironed. Thanks for share this. . .
i like your product . i am glad to see this . . . Thank you for the fantastic article. The place else could anyone get that kind of info in such a perfect means of writing? I have a presentation next week, and I am at the search for such information. To get new information visit here. I recently got a successful Hair Transplant In Ludhiana and my self confidence is higher than it has ever been! It's such a relief to finally find something that works. Textured hair whether curly or wavy, has the inherent tendency to be dry as compared to http://www.vohair.com straight hair. Every time you wash this type of hair, it gets stripped of natural oils and becomes drier.Ideally, full lace wigs with silk top you need to wash your hair every couple of days and each time you do it, make sure that you use a conditioner after the shampoo. You can also apply a leave-in serum, applying it at the hair ends for best effects and carefully comb the strands to detangle.full silk wig This will lock in the moisture, leaving you with great looking hair. کاشت مو در مردان، از موهای پشت سر اشخاص برای کاشت مو بهره می گیرند. موهایی که از پشت سر اشخاص به ناحیه هایی که ریزش مو کامل شده انتقال داده می شود، دیگر گرفتار ریزش نمی گردد. چند روز قبل از ولنتاین که معمولا با خرید کادوی ولنتاین همراه است، همه می پرسند ولنتیان چندمه؟ کادوی ولنتاین ۲۰۱۷ چیه؟ یا در فرهنگ مسیحی روز عشق یا روز عشاق خوانده شده است که به صورت سالانه برگزار می شود. در این روز کسانی که عاشق هم هستند هدیه ها و کادوهایی را برای ابراز عشق خود به یکدیگر خریداری می کنند. Beautiful hair care, how to care and keep your hair is always healthy ... The thing you do every day is hair care with conditioner turned out to bring great benefits.